The saw-whet owl, among the smallest owls in North America, once thought a year-round resident of northern territories, now migrates as far south as Virginia. It’s 3 a.m. in mid-November of a recent year, well past the witching hour on Virginia’s side of the Delmarva Peninsula. The loblolly pine woods smell of decay; fallen leaves are a slippery mulch. Briars tangle in my hair as I trip down a narrow, root-lined path. Somewhere in the darkness of night an owl calls . . . and calls . . . and calls. Breaking free, I catch up to the flashlights that wink in the distance. “Shhhh,” warns biologist Fletcher M. Smith. He points to a thirty-six-foot-long mist net strung between steel poles. Two tiny northern saw-whet owls blink at us; they’re caught in the fine mesh. A researcher from one of the teams in Project Owlnet retrieves a northern saw-whet owl, from a mist net site in southeastern Virginia. The bird will be examined and banded, then released. The study is designed to learn more about the species’ fall migration. Smith, of the Center for Conservation Biology run by Virginia Commonwealth University in Richmond and the College of William and Mary in Williamsburg, is one of a group of scientists investigating the autumn migration of northern saw-whet owls (Aegolius acadicus). 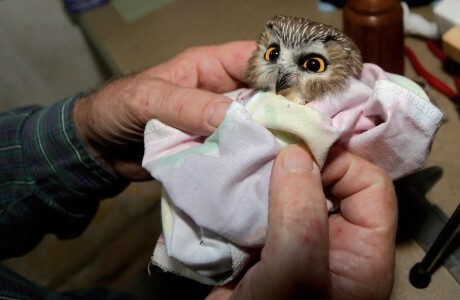 The owl calls are recordings, CDs of saw-whet owl hoots playing in covered plastic buckets beneath the mist nets. The repetitive tooting note beckons like a potential mate; even sharp owl eyes don’t see the nets until it’s too late. Once trapped, the owls are banded on one leg with a United States Fish and Wildlife Service numbered metal ring. The study, which began in 1994, is the first to document large numbers of migrating saw-whet owls south of Maryland. Northern saw-whet owls, among the smallest owls in North America, eat deer mice, voles, and other rodents. During the spring and summer they breed in the coniferous forests of southern Canada and the northern U.S., nesting in tree cavities, especially abandoned woodpecker holes. In late fall, the owls fly south along two major corridors, the Atlantic coastline and the Ohio River valley, to the mid-latitudes of North America. In eastern Canada, for example, saw-whets begin moving south in early to mid-September, reaching northern Pennsylvania in late September, central and southern Pennsylvania the first week of October, and then making their way onward. The migration is accepted knowledge now. But it wasn’t always so. Until the early 1900s it was believed that the owls remained in their northern territories year-round. Then came October 1906. “The Saw-whets were a surprise,” he stated in The Auk. “One sees them only at intervals of many years. Evidently they migrate in considerable numbers.” Saunders’s unfortunate find was the first scientific report of migrating northern saw-whet owls. 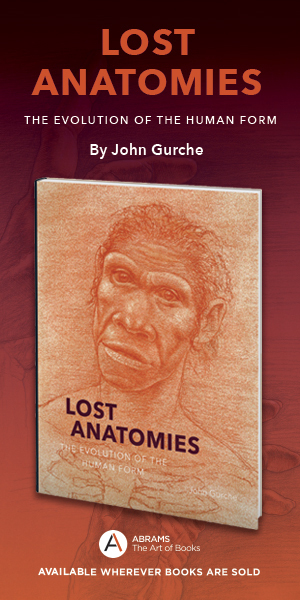 During the following decades, new discoveries were made on saw-whets’ migration. But scientists didn’t develop widespread insights into the owls’ fall activities until 1994, when raptor biologist David Brinker of the Maryland Department of Natural Resources founded Project Owlnet. Since then, the project has grown from five cooperating saw-whet owl banding stations in Maryland to a network of more than fifty from Maine to Alabama and as many again in Canada. Together they annually catch 8,000 to15,000 migrating owls. 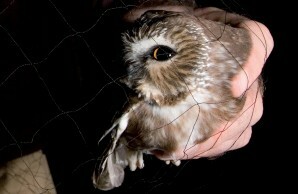 Project Owlnet’s goals are to support expansion of the network of migrating-owl banding stations; to advocate the use of comparable netting protocols so results may be compared; and to increase overall coordination of owl-banding stations in North America to help scientists uncover the intricacies of owl migration. Northern saw-whet owls’ basic pattern resembles that of other temperate-zone bird species that have evolved to migrate far north to breed, taking advantage of the temporary abundance of resources there while escaping the competition of nonmigrating species. Banding stations have also documented the owls’ spring migration, but saw-whets’ flights north are spread out over time and location, so relatively few owls have been captured. When cold northwest October winds begin to blow, however, the owls quickly take heed. Most of eastern North America, especially the owls’ northern breeding range, has winters with deep snow cover and long periods with temperatures well below freezing. Capturing small mammal prey under those conditions is challenging. So the owls begin their journey south. 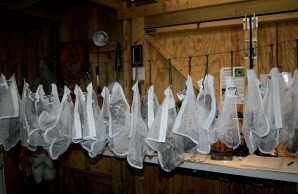 Along the way, some are caught in nets at Project Owlnet stations. The greatest numbers are snagged on moonless nights with light northwest winds and falling temperatures, especially just after a strong cold front passes, and on windy days that become calm after dark. An analysis of 81,584 northern sawwhet owl captures across eastern North America reveals a southbound annual fall migration “front,” with peak banding activity occurring progressively later in the season toward the south. The earliest banding dates are in eastern Ontario and Quebec; the latest are in Delaware, Virginia, West Virginia, and Indiana. The results, published in 2011 in The Wilson Journal of Ornithology by biologists Sean R. Beckett and Glenn A. Proudfoot of Vassar College in Poughkeepsie, New York, show that the owls follow the same routes from one year to the next. 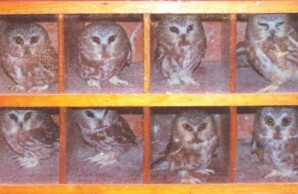 Most of the owls netted are females. The lure call that’s played at mist nets (the “advertisement call”) is made in the wild by males. Females are therefore caught at a higher rate than males. Another reason more adult females are snagged, according to Brinker, is that adult males tough out the winter near breeding areas. Come spring, that puts them in a better position to compete for territories that offer trees with nest cavities. It’s harder and harder to find such trees, says Smith; old-growth forests are in decline. Owls—whether female or male—that migrate south for a milder winter and more abundant prey also seek out habitat that provides camouflage. 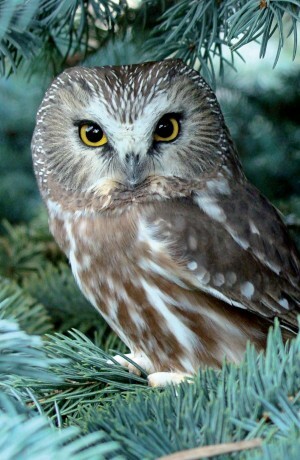 Northern saw-whet owls are often preyed upon by larger owls, especially barred owls and great horned owls. “When deciduous trees lose their leaves each autumn, cover available to saw-whet owls in the northern and central U.S. decreases dramatically,” says Brinker. Saw-whets’ autumn migration usually occurs just as autumn foliage is passing its peak. Then coniferous or evergreen habitats become attractive hiding spots. Southeastern coniferous forests also have dense understories with evergreen shrubs such as laurel, rhododendron, American holly, bayberry, and magnolia. 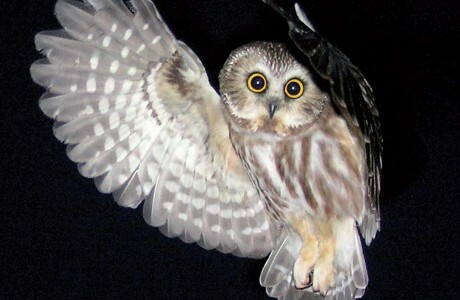 A northern saw-whet owl in flight is startled by a camera flash. Because they may be preyed upon by larger owl species such as great horned owls, the small saw-whets migrate at night, avoiding times when the Moon is bright. To get to their wintering grounds, saw-whets usually migrate on nights of the new or crescent Moon. On full Moon nights, they hide in conifers, the better to avoid predators. This November night on the Virginia Eastern Shore is in the “safe zone”: a quarter Moon. In southeastern Virginia, Smith and his team make net runs to three sites in the forest:one in a national wildlife refuge at Wise Point, another on the Chesapeake Bay side of the peninsula at Kiptopeke State Park, and a third on the peninsula’s east side in a Virginia Department of Game and Inland Fisheries wildlife management area. Runs take place at 9 p.m., midnight, 3 a.m., and 6 a.m. “In case you forgot how to pull an all-nighter, you’re about to relearn,” laughs Smith. Saw-whet owls gathered on a nighttime net inspection await their turns in the “owl hotel,” a multiroom owl carrier. At each net check, owls are carefully extricated from the mesh, then housed in “hotels,” vertical wooden cases with screens across five-inch by five-inch by twelve-inch “rooms.” The standard owl hotel accommodates eight owls; larger ones can house several times that many birds. At the peak of the Virginia saw-whet owl migration in early November, the hotels often have “No Vacancy” signs. Once full, they’re carried through the dark forest and loaded into the back of a waiting Jeep Cherokee, then driven to the Delmarva study headquarters, a small house near the wildlife refuge. There the scientists take the birds one at a time from their rooms to examine them under diningroom lights. Each owl is measured, weighed, and banded. Under ultraviolet light, porphyrin pigments in the feathers on the underside of an owl’s wing fluoresce a strong pink. Porphyrins are easily destroyed by sunlight, so the degree of fluorescence is a clue to a feather’s—and the owl’s—age. Smith also shines “black,” or ultraviolet (UV), light on each owl’s feathers. UV light causes porphyrin pigments in the feathers to fluoresce with a strong pink glow. Porphyrins are easily destroyed by exposure to sunlight, so are most abundant in new or recently grown feathers on the underside of an owl’s wing, which is more protected from sunlight. Older feathers, those two years or more in age, appear chalky or yellowish-white under black light, showing little to no fluorescence. Feather molt—when new feathers replace old ones—happens in each owl species in a predictable sequence, explain raptor biologist Scott Weidensaul and colleagues in a paper published in The Wilson Journal of Ornithology. 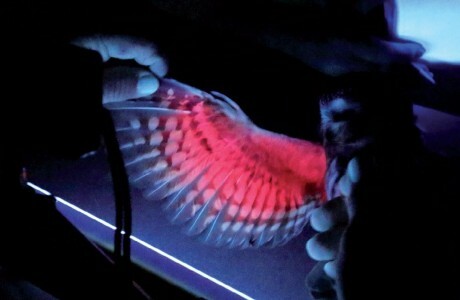 Thus looking at feathers under UV light allows for an accurate assessment of an owl’s age. The information is helping biologists learn which age classes of owls are using what aerial pathways south, and when. Do younger (or older) birds migrate earlier or later in the season, or more frequently overall? Does one age group have a preference for a certain route? It may be that juveniles are more likely to migrate than adults, and tend to move farther south. It’s time for our 6 a.m. net run. The bleary-eyed biologists have just finished “processing” the eight birds collected in the 3 a.m. check. All are returned to the locations where they were caught. Project Owlnet scientists are also looking at the big picture: which habitats the owls prefer while they’re in the neighborhood. “The end of the 180-milelong Delmarva peninsula, for example, is their last stop before a long flight across the big pond,” says Bryan D. Watts, director of the Center for Conservation Biology. The “big pond” is the 17.6-mile-wide mouth of Chesapeake Bay where it meets the Atlantic Ocean. That gap lies a mile or less from the net-lined loblolly pine woods. Evergreen trees provide saw-whet owls with safe cover in winter after deciduous trees have lost their leaves in the fall. “Virginia’s Eastern Shore acts as a funnel or bottleneck each fall,” Watts says, “concentrating southgoing birds, including saw-whet owls. It gives us a unique view of what might be termed ‘stopover ecology.’” Coastal forest just inland is a saw-whet owl favorite. 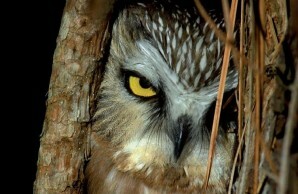 The owls stop by these piney woods, sometimes for as long as ten days, before crossing open water and continuing south. Biologists in coastal Maine have made a similar discovery. Researchers at the Biodiversity Research Institute in Gorham, Maine, captured migrating saw-whet owls on Maine’s coastal islands. Owls fly at night, landing along the way on such islands as Isle au Haut, Vinalhaven Island, Monhegan Island, and 700-Acre Island. The islands are stepping-stones on their journey. Results from the Delmarva Peninsula and Maine’s islands are being used in decisions about where to place coastal wind farms, under review from New England to Virginia. On the southern tip of Virginia, some 3,500 northern saw-whet owls have been banded since 1994, more than at any other eastern U.S. saw-whet owl research site. “It’s certainly a lot more owls than we thought,” says Watts. In owl “irruption” years, a near river of owls moves south. Irruptions happen, on average, every four or five years, when there’s an especially productive breeding season, and so more young owls to fly south. The first irruption to be documented was in 1965. From eastern Canada south through New England to the mid-Atlantic, banders and birdwatchers noted the abundance of the owls. Other irruption years were 1995, 1999, 2003, and 2007. More than 100 owls may be captured each night. When would the next irruption happen? In the fall of 2012. By September, word had drifted down from Canada that owls were on the move early, and in greater numbers than usual. In anticipation, banders in the northeastern U.S. hurried to set up their nets. An owl at a banding station in Turkey Point, Maryland, is on its way back to the night after examination and tagging. 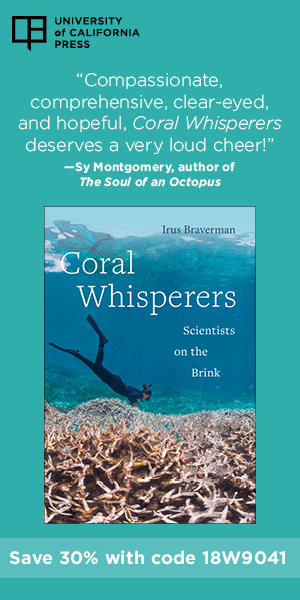 In Maryland, Brinker and the biologists that work with him staff a necklace of banding stations across the state, from near McHenry in the west to the Assateague Island National Seashore in the east. Only Lamb’s Knoll, however, requires braving the town where The Blair Witch Project was filmed in 1999. Whatever you do, locals say, don’t turn onto the road for Burkittsville. The woods surrounding the town are haunted, they claim, and were so long before the movie was shot. Lamb’s Knoll, referred to as Lamb’s Old Field in the nineteenth century, is likely named for Milton and Mary Lamb, believed to have farmed the knoll’s summit in the 1830s.Today the site belongs to the Federal Aviation Administration (FAA) and other agencies—by day. By night, it’s the province of the owls. By November 10, Steve Huy, who’s in charge at the knoll, had already netted 132 saw-whet owls for the season, 33 of them on November 9 alone. Each owl is carefully extricated from a net, placed in a white mesh bag, and carried along a pitch-black, rocky trail to a small cabin. The hut, lined with banding manuals and Harry Potter novels, is perched amid FAA and other communication towers. The owls are weighed and measured before being returned, one by one, to the wild. Atop Lamb’s Knoll, an owl from the midnight net check is about to be set free. In the stillness of the wee hours, it perches on an assistant’s finger. The Moon is new; only the Milky Way illuminates a path from the hut to a forest clearing where the owl will be released. A last look at the strange creatures it met on its journey south, and the owl soundlessly flaps once, flying up and beyond our sight, somewhere between the night and the stars.